Israeli technology satellite. Ofeq, meaning 'Horizon', was a technology demonstration satellite developed by IAI (Israel Aircraft Industries) for ISA (Israel Space Agency). Technology satellite built by IAI, MBT for ISA, Israel. Launched 1988 - 1990. Used Ofeq-1 Bus. Status: Operational 1988. First Launch: 1988-09-19. Last Launch: 1990-04-03. Number: 2 . Gross mass: 157 kg (346 lb). Height: 2.30 m (7.50 ft). Israel became the eighth nation to launch an indigenous satellite when Ofeq 1 was placed into a unique retrograde low earth orbit. The full payload was not disclosed but included magnetometers and house-keeping / monitoring equipment. Later satellites with the same name would be operational optical surveillance satellites. The only malfunction in Ofeq-1 was in telemetry memory; the computer switched to backup. Expected life was a few weeks but the satellite did not re-enter until January 14 because of a higher than expected orbit. Announced functions of the satellite were: 1) Experimentation in generation of solar power; 2) Experimentation in transmission reception from space; 3) Verification of system's ability to withstand vacuum and weightless conditions; 4) Data collection on space environment conditions and Earth's magnetic field. The spacecraft was an irregular octagonal prism of conventional aluminum. Mass budget (kg): structure 33, power system 58, computer 7, communications 12, thermal control 5, wiring 9, instrumentation & balance masses 32. Ofeq was spin stabilized at 400 deg/sec, and the 16 solar panels provided 246 W and recharged a 7 Ah NiCd battery; typical consumption was 53 W. S-band telemetry was returned at 2.5 kbit/s from a 128 kbyte memory. Attitude sensing was provided by a 3-axis rate gyro, magnetometer and Sun sensor. Any payload was classified except for the magnetometers and housekeeping monitoring functions. Family: Surveillance orbit, Technology, Technology satellite. Country: Israel. Launch Vehicles: Shaviyt. Projects: Ofeq. Launch Sites: Palmachim. Agency: ISA, IAI. Bibliography: 2, 5, 6, 12899. 1988 September 19 - . 09:32 GMT - . Launch Site: Palmachim. LV Family: Jericho. 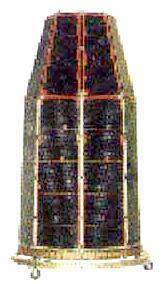 Launch Vehicle: Shaviyt. Ofeq-1 - . Mass: 155 kg (341 lb). Nation: Israel. Agency: ISA. Program: Ofeq. Class: Technology. Type: Navigation technology satellite. Spacecraft: Ofeq 1-2. Decay Date: 1989-01-14 . USAF Sat Cat: 19519 . COSPAR: 1988-087A. Apogee: 1,149 km (713 mi). Perigee: 250 km (150 mi). Inclination: 142.90 deg. Period: 98.80 min. First Israeli launch; possibly experimental surveillance mission. Experimental satellite 'Offeq-1'. Launch time 0934 GMT. Location: site on the coast south of Tel-Aviv. Launching organization: Israel Aircraft Industries, Ltd (IAI) and Israeli Space Agency (ISA). Function: 1) Experimentation in generation of solar power; 2) Experimentation in transmission reception from space; 3) Verification of system's ability to withstand vacuum and weightless conditions; 4) Data collection on space environment conditions and Earth's magnetic field. 1990 April 3 - . 12:02 GMT - . Launch Site: Palmachim. LV Family: Jericho. Launch Vehicle: Shaviyt. Ofeq-2 - . Mass: 160 kg (350 lb). Nation: Israel. Agency: ISA. Program: Ofeq. Class: Technology. Type: Navigation technology satellite. Spacecraft: Ofeq 1-2. Decay Date: 1990-07-09 . USAF Sat Cat: 20540 . COSPAR: 1990-027A. Apogee: 251 km (155 mi). Perigee: 149 km (92 mi). Inclination: 143.20 deg. Period: 88.50 min. Communication experiments. .